Lovin' Lyrics Music Promotions: CD GIVEAWAY - ALABAMA "ANGELS AMONG US - HYMNS AND GOSPEL FAVORITES" AND NEAL MCCOY "PRIDE: A TRIBUTE TO CHARLEY PRIDE"
CD GIVEAWAY - ALABAMA "ANGELS AMONG US - HYMNS AND GOSPEL FAVORITES" AND NEAL MCCOY "PRIDE: A TRIBUTE TO CHARLEY PRIDE"
Congratulations Mary Sue Spears! You are the winner of the CD's below. We have contacted you for your mailing address. Merry Christmas! 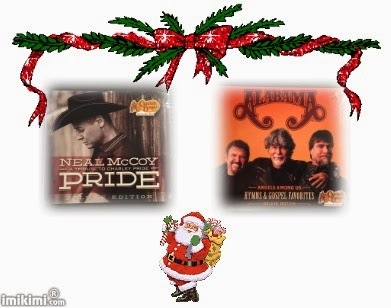 This year, unfortunately, we are unable to do the usual big multi day Christmas giveaway but we do have a couple of CD's that we would like to give to one of you. It's not much but it's music and music is why we're here and it's our small way of saying thank you for being here. All you have to do is tell us what Christmas means to you either on Twitter or on Facebook using hashtag #LLContest. Hopefully your idea of Christmas may make an impression on someone else and become part of their love of the season. We'll pick a random entry for the CD's. Winner will be chosen tomorrow, Christmas Day.